Cauldwell Hall – the name can be found on our Street name derivations page – as a farm, is said to date back to Anglo-Saxon times. After the Norman Conquest in 1066, lands were seized by King William I and gifted to the new Norman establishment, in this case to Roger Bigod***, the High Sheriff of Norfolk and Suffolk. The name 'Cauldwell' or its variants, as a Manor, may date from the early 14th century in the ownership of the Holbroke family. John de Holbroke, son of Richard de Holbroke, held the manor in about 1300, but died in 1376 and the estate passed the same way as the Manor of Holbrook. However, Edmunde de Caldeswelle appears to have been in residence in the Holbrook manor house in 1327; successive generations of Caldwells became well respected citizens in civic and religious matters. The first record of a Caldwell living at Caldwell Hall was in the 15th century, but it is likely that the family had been living there for many generations prior to this, even though it was owned by the Holbroke family. From a contemporary record from a time in the history of the town when the Craftsmen's Guilds flourished, there is a reference which reads: 'In 1444, John de Caldwell, in residence at Caldwell Hall, is to pray for the good state of the merchant's Guild'. In the Accounts of the Corpus Christie Guilds & Pageants in the 23rd year of Henry VI (1445) mention is made of John de Caldwell who played a prominent role in the procession and was again described as a member of the family resident at Caldwell Hall. In the 16th century when Caldwell Hall was still part of the extensive property of the Christchurch Priory, the assets of the Priory were seized by Cardinal Wolsey to provide funds for his ill-fated College which he started to build in Ipswich in the late 1520s. With his fall from grace and subsequent death, the Priory with its lands passed into the hands of Sir John Pope and then the Withepole family, who built Christchurch Mansion in 1563. It stayed this way for many generations. By the early part of the 17th century, the Caldwell Hall estate had passed to Robert Leman. At his death in 1637, Leman left to his daughters Caldwell Hall and, amongst other properties, a sizeable mansion in Upper Brook Street and £10 to the Ipswich Public Library, a frerunner of the current library. In 1775 William Rivers took out a loan of £3000 from Tobias Rustat, Rector of Stutton to buy the 550 acre Cauldwell Hall estate using the estate itself as security. Sometime prior to this, the estate had been in the occupation or tenure of John Wilkinson, then Robert Wilkinson at a yearly rent of £100. By the time it was surveyed by Samuel Lewis for William Rivers in 1793, the estate was just over 403 acres in size. The vast majority of it (369 acres), was within the parish of St Margaret, with 14 acres each in the parishes of both Rushmere and St Helen. An additional three acres were taken up by roads on the estate. The estate stretched from the Foxhall Road in the south to Sidegate Lane, where today it meets the Colchester Road in the north. To the west the boundary is roughly in line with today's Spring Road viaduct and in the east where the Woodbridge Road meets Spring Road at the Lattice Barn public house. By 1809, the Rivers family decided to sell land off to pay off the interest on the mortgage bringing down the size of estate to around 400 acres. Although the interest had been paid off, the original £3000 mortgage still remained outstanding. In 1822, with John Rivers not in good health, it is not surprising that they were looking to liquidate their assets. The Cauldwell Hall estate had been farmed by the Rivers family for three generations but clearly John Rivers, grandson of William Rivers, could no longer cope with the demands of the 400 acre estate. Estate sale and the F.L.S. In 1848 the whole estate was bought by John Footman who was a proprietor of the well established Ipswich linen and woollen drapery business, John Footman & Co, later to become Footman, Pretty and Nicholson. John Footman quickly sold on large areas of the property and it is likely that he was acting on behalf of a number of others; perhaps they had agreed not to bid against each other to ensure a bargain price. It is not known who bought the Cauldwell Hall Farmhouse, nor who did the extensive makeover in an Italianate style, including a signoral tower. From 1919 to his death in 1956 Cauldwell Hall was the home of the Ipswich solicitor Lionel H Vulliamy. When Lionel Vulliamy purchased Cauldwell Hall he was a partner in the family firm of Vulliamy and Son. By 1922 the firm had merged with Steward and Rouse becoming Steward, Vulliamy and Aldous, who were based in Arcade Street, Ipswich. During his ownership of Cauldwell Hall, Lionel Vulliamy landscaped the lower gardens including the old pond and introduced flamingos to the grounds. Photographs from the Vulliamy family album show how this work progressed. They also give a good view of the overall extent of the house and grounds in the 1940s and 1950s. After Lionel H. Vulliamy died, the property was sold to L. D. Bloom Estates who divided Cauldwell Hall into apartments and built Trafalgar Close in the lower grounds. The gatehouse and trees fronting on to Spring Road were taken down in 1956. Today, looking up from Spring Road, Cauldwell Hall can be glimpsed through the trees, high above the road. The development of the Cauldwell Hall Estate for housing started in the early days of the Ipswich & Suffolk Freehold Land Society (F.L.S.) which was formed in 1849: the year of the California gold rush – hence the nickname of the area*. The extensive farmlands belonging to Cauldwell Hall, which in its Victorianised version still stands off Cauldwell Avenue overlooking Spring Road, came up for sale in 1848. The land was sold off to various buyers. One of these was William Dilwyn Sims who became Vice-President of the F.L.S. and acted as agent in the purchase of ninety-eight and a half acres of the Estate on 18 October 1850. The Ipswich & Suffolk Freehold Land Society could not legally purchase land in its own right, so he made the land over to the F.L.S. some time during 1850. The price was £4,992: over £50 per acre. The land between Woodbridge Road and Foxhall Road was divided up into 282 plots, each of which was offered to senior members of the F.L.S. at £21.10 shillings each. Among expenses were £26 for staking out and £480 for making roads, which were laid out in a grid pattern. New roads named Cauldwell Hall Road and Britannia Road formed the western and eastern boundaries respectively, with Freehold Road bisecting the area from west to east between the two. Howard Street, Milton Street and Kirby Street were laid out between Woodbridge Road and Spring Road. Crabbe Street, Cowper Street and Bloomfield Street were laid out between Spring Road and Freehold Road, also Parliament Road between Freehold Road and Foxhall Road. The estate was divided by Christopher Fleury (architect of the first Ipswich Museum and Ipswich School on Henley Road), the Society’s Surveyor who stated, when announcing the allocation of the allotments, that he was ’… aware in the division of so much property difficulties might arise in giving satisfaction to so many allottees; ... Indeed, this was to prove the case and it may be why from then on, a ballot was held to allocate the plots for all subsequent land purchases by the Society. Kemball Street and Henslow Road drop down from Freehold Road between Cauldwell Hall Road and Parliament Road. Two parallel, east-west roads were planned between Kemball and Henslow, but were never built. See our Street name derivations for the sources of these last two thoroughfares. Above: the boundaries of the California estate marked in pink on a 1902 map. Note the limited housing development at this time. 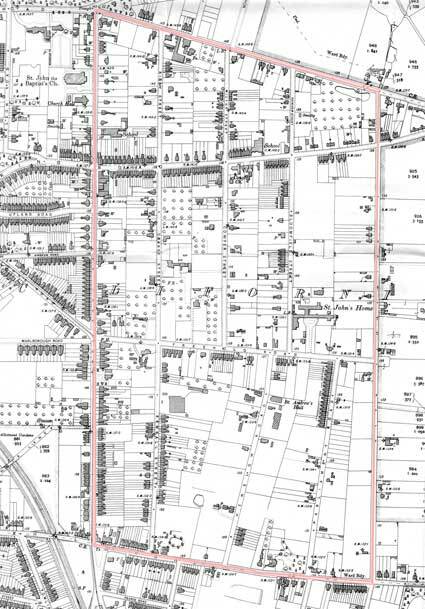 A brickyard existed to the east of Bloomfield Street, (see our Wherstead red brick page for more on this and other brickyards) and the public house The Brickmakers Arms survives near to the north of the street. George Crabbe (1754-1832) was born in Aldeburgh, Suffolk. He was an English poet, surgeon, and clergyman. He is best known for his early use of the realistic narrative form and his descriptions of middle and working-class life and people. John Milton (1608-1674) was an English poet, polemicist, man of letters, and a civil servant for the Commonwealth of England under Oliver Cromwell. He wrote at a time of religious flux and political upheaval, and is best known for his epic poem Paradise Lost (1667), written in blank verse. John Kirby (1690-1753) was an English land surveyor and topographer. His book The Suffolk Traveller, first published in 1735, was the first single county road-book. Kirby lived in Wickham Market, Suffolk and spent three years between 1732 and 1734 surveying the entire county. For part of this project he was accompanied by Nathaniel Bacon. In 1736 he published a large-scale map of Suffolk. Subscribers to this received a copy of his book as a free gift. A further large scale map was published the following year. He was the father of John Joshua Kirby (born in Wickham Market 1716-1774), landscape painter, engraver, and writer, topographical draughtsman and architect, famed for his pamphlet on linear perspective based on Brook Taylor's mathematics. Robert Bloomfield (1766-1823) was born of a poor family in the village of Honington, Suffolk. He was an English labouring class poet whose work is appreciated in the context of other self-educated writers such as Stephen Duck, Mary Collier and John Clare. William Cowper (1731-1800) was an English poet and hymnodist. One of the most popular poets of his time, Cowper (more correctly pronounced 'Cooper') changed the direction of 18th century nature poetry by writing of everyday life and scenes of the English countryside. A Hertfordshire boy, there doesn't appear to be any link to Suffolk. Henry Howard, Earl of Surrey, KG (1517-1547) was an English aristocrat, and one of the founders of English Renaissance poetry. He was a first cousin of Catherine Howard, the fifth wife of King Henry VIII. He was the eldest son of Thomas Howard, 3rd Duke of Norfolk. In 1850 building started straight away. By Census day, 30 March 1851, some 27 houses had been erected: 21 of them occupied. They were scattered over the estate and are difficult to locate exactly on the Census returns. Roads had not then been named and the area was simply known as The Cauldwell Hall Estate. Until October 1850 there was a levy on building bricks, making them expensive. 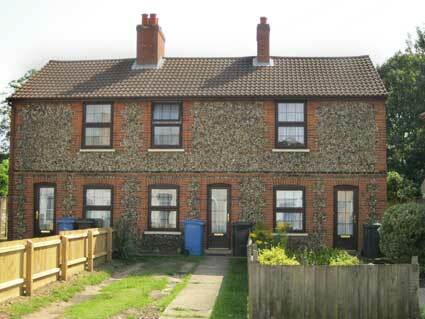 Early houses were therefore built of flint rubble, using bricks for the corners , window and door dressings and chimneys. A few such houses remain including short terraces at 173-177 Cauldwell Hall Road (shown below) and nos. 9-13 Cowper Street. 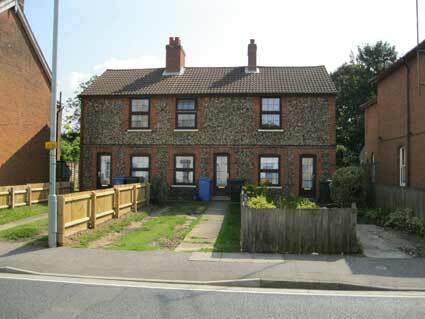 Set back from the building line of surrounding houses, these cottages use the cheapest unknapped flint construction materials with red brick quoins and door and window detailing. Because of the 'cobble' shapes, these flint walls require regular maintenence because without it they can weaken and collapse. In Freehold Road on the corner of Kemball Street is a larger, flint-built house – now a pair – originally called Kossuth Cottage. Most other flint-built houses have been replaced by modern buildings. The size of Kossuth Cottage is an indication of both the 'non-standard' and piecemeal nature of building which took place on the state. Another example can be found in St Johns Road: Gothic House, which is today number 5. The builder was Henry Ringham to the design of an architect working for Phipson. Henry Ringham was a noted wood-carver who did much restoration work in Suffolk churches. He was self-taught in reading, writing, drawing and carving. As a builder in 1861, he had forty men and two boys working for him. However, having cash-flow problems, he was forced to sell Gothic House in 1863 to Abednigo Chaplin, whose elder brother became great-grandfather to legendary silent film star, Charles Chaplin. Despite falling on harder times, Righam's wood-carving reputation earned him a place in history when nearby Chapel Lane was renamed Ringham Road. Although the original intentions and principles upon which the Ipswich & Suffolk Freehold Land Society were based: to create ‘forty shilling freeholders’ – giving the ordinary man the chance to buy enough land to entitle him to vote, inevitably businessmen and speculators found ways of increasing their balotted allocations of land and plots changed hands, sometimes from the outset. The 1879 F.L.S. map related to our Rosehill case study page, although strictly speaking just outside the original California area, indicates that the plot on which the branch library was eventually built was sold early. It was not alone. Much of the information on this page has been drawn from the unpublished research of the California development by Hilary Platts, to whom our thanks. 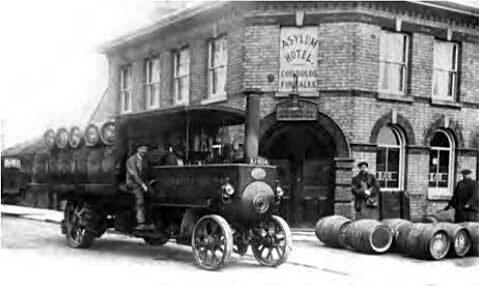 Above: The Asylum Hotel – names were brutally frank in them days – at 389 Foxhall Road, near to the Borough Asylum (later St Clement's Hospital). This public house on the corner of Parliament and Freehold Roads dates to the late 19th century and was renamed The Heathlands in the 1920s. Today it is a supermarket. The blind window above the attractive, arched corner entrance bears the words: 'ASYLUM HOTEL - COBBOLDS FINE ALES', with an unreadable curved iron nameplate behind the lamp. The Freehold Land Society illustration and map above shows the 'Garden Farms' which were a feature of some FLS developments. 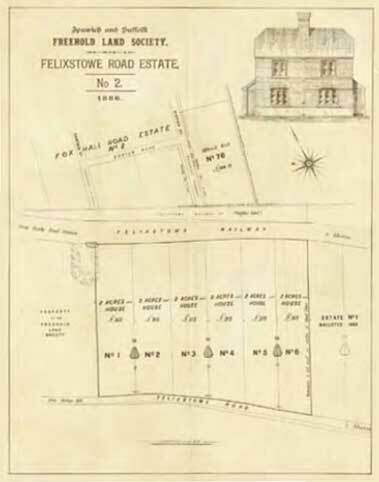 The houses were built within two acre plots facing Foxhall Road and Felixstowe Road. The smallholding plots have since been redeveloped, but a handful of the semi-detached houses survive shown on our Felixstowe Roads FLS houses page. Interestingly, the map of California as defined in this Borough document is larger than the area originally established by the FLS. Street index; Origins of street names in Ipswich; Streets named after slavery abolitionists. Named buildings list; Named (& sometimes dated) buildings examples.